Reddit is not happy with EA right now. A response the iconic gaming studio left to address criticism aimed at its upcoming Star Wars: Battlefront 2 game has become the most downvoted comment in the history of the website. Responding to miffed Redditors complaining about locked characters (including key figures like Darth Vader and Luke Skywalker) and the amount of time it takes to unlock them, EA decided to chime in and explain its choices to the community. Unfortunately, their reply did not breed the results they were hoping for. The comment has attracted over 300,000 downvotes (and counting), becoming Reddit’s most downvoted comment by a landslide. 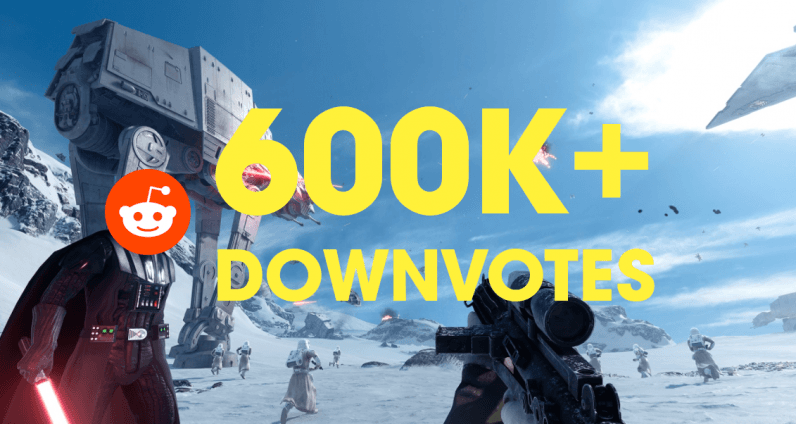 By comparison, the second most downvoted comment on the platform currently stands at a negative of 24,333 downvotes – more than 10 times less than EA’s post. According to calculations done by Redditors, earning enough credits to unlock fan-favorite characters like Darth Vader and Skywalker could take up to 40 hours of playing – though this could vary. Following the outrage at Star Wars: Battlefront 2‘s ridiculous unlock system, Redditors are calling on fellow members to cancel their pre-orders, arguing this is the only way to make their voices heard. Update: Following the backlash, EA has opted to adjust the credits necessary to unlock characters by 75 percent, Kotaku reports. Update 2: EA has now also removed microtransactions from Battlefront 2, Motherboard reports. The feature is currently undergoing changes and will be reinstated once developer DICE has sorted out the shortcomings in the setup.